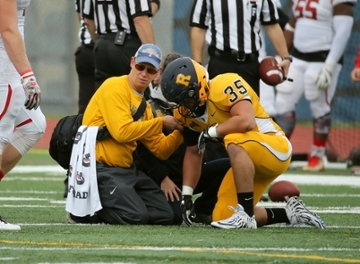 The training staff in the Department of Athletics and Recreation provides injury care and prevention to all 23 varsity intercollegiate programs. We use all the medical facilities that the University of Rochester has to offer in order to give our student athletes the best care possible. Below is important information for visiting teams. For a printable version, please see our information packet (PDF). Faxes to the athletic training staff can be sent to (585) 461-5081. Treatment hours are Monday, Tuesday, Thursday and Friday, 10:30 a.m.–2:30 p.m and Wednesday 1 p.m.–4 p.m. There is a sports medicine staff member available until practices are complete for the day. Weekends are scheduled according to athletic events. Our sports medicine staff will be available at least one hour prior to athletic events. Ice, water, first aid supplies, and cups are available at each event. If your athletes require specific modalities (such as ultrasound, muscle stimulation, whirlpool, etc.) we require a note from your team physician or a staff certified athletic trainer. Please have your athletic trainer contact our staff at least 48 hours in advance for any of the modalities listed. If your team is traveling without a certified athletic trainer, please send all needed taping supplies with a member of your team. Your name and that you are a coach, student, etc. Answer any questions they have and wait for them to hang up. Public Safety will arrive and direct the ambulance to the location. DO NOT move the athlete until medical assistance arrives.